You could drive around Niagara all your life and never discover Calamus. But if you were a seeker of good picnic spots on the Beamsville Bench you might be very familiar with this winery which is situated right beside Ball’s Falls Conversation area. This is how I first came upon Calamus and I loved the tiny, rec room-style tasting bar in the corner of an old barn. The renovators have since moved in and now you could take anyone here. And you should, because the wines are very good and still rec room priced. 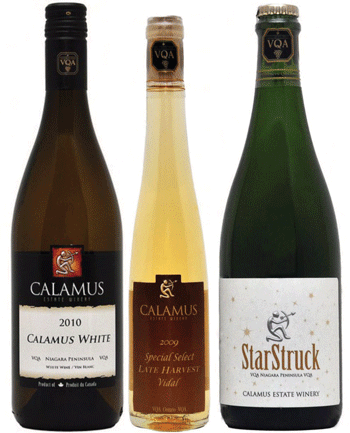 I’ve been recommending Calamus multi grape blend white for several years and the 2010 vintage is once again one of the best ‘house whites’ you can buy. The zest of Riesling, a hit of Chard richness and a whiff of the exotic flavours of Gewurztraminer. Everyday white doesn’t get much more delicious. Most days I’d take a glass of Calamus SSLH Vidal over Icewine. Lovely but also lively, and lighthearted – delicious to sip anytime. Especially after an alfresco summer lunch. You gotta love a sparkling wine called StarStruck. 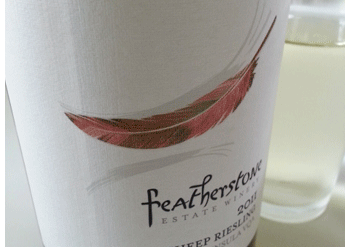 Made from Riesling it is very refreshing with delicate flavours – the feeling of being at a posh event. Off-dry, lightly bubbly, it would perfect for weddings, or Summer events of any kind. Handy beer-cap closure.